An innovative dirt bike for the seriously tough missions! KTM’s slick marketing made sure that every dirt-oriented rider heard about the arrival of the all-new KTM Free Ride enduro/trials hybrid. While the KTM arrived to much fanfare, revived Spanish manufacturers Ossa also brought a new hybrid design to the market in 2012, the Ossa Explorer. Grizzled veterans of the off road world know for a fact that the hybrid trials/enduro bike is no new innovation, in fact its been done often, by Gas Gas, Scorpa/Sherco and Beta to name recent examples and as long as 30 years ago by Bultaco, Montesa and even Ossa themselves with their previous incarnation, called then as now the Explorer. Go even a little further back and even the Brits arguably produced hybrids of sorts. Trials and enduro, though both off road disciplines, come from different corners of the ring and each have their adherents. In some cases these individuals cross tribes, but unfortunately not often enough. The subtle skills of trials until the very recent advent of Extreme Enduro were not well appreciated by the enduro fraternity and its also fair to say that trials purists have been slow to appreciate that bikes with weird gear ratios, a teacup of petrol and nowhere to sit, don't have wide appeal to trail riders, the mass market of off road riding. Back in the 1970s when trials bikes were versatile enough for trail riding, the sport of trials prospered as a result. 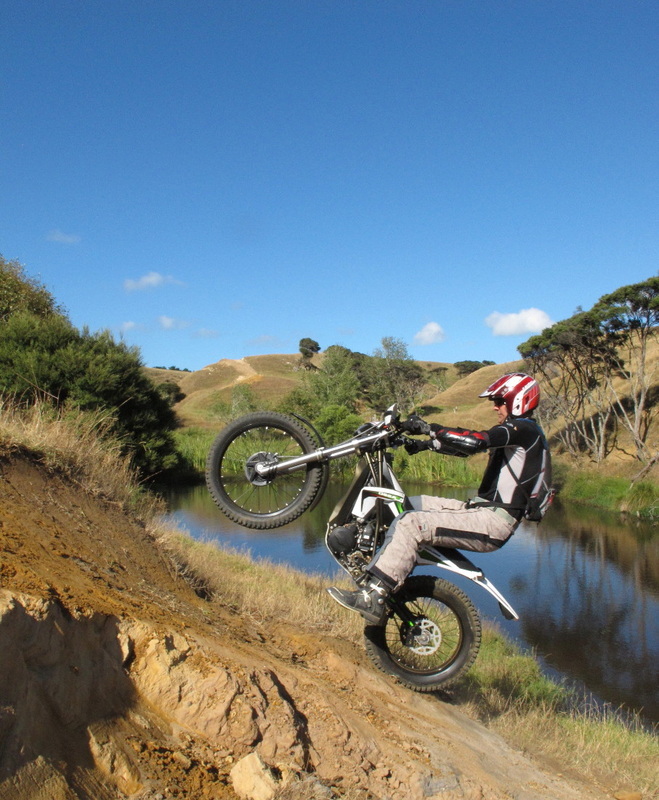 However, since the Japanese manufacturers jumped out of the market trials bikes have not been well represented in many parts of the world, NZ included. This is despite the huge body of evidence that tells us that good trials riders often make great enduro racers; ie the likes of Stefan Merriman, Chris Birch, Graham Jarvis, Andreas Lettenbichler, Taddy B, and the list does go on, all have strong trials backgrounds. The trials/enduro hybrid is intended to fill the gap between the precise low speed world of trails and the high speed of all-out enduro. The perfect hybrid would be a machine that had greater manouverability than an enduro bike at low speed, but greater power and suspension and therefore higher speed potential than a trails bike. So far however most hybrids have been built from a trails base and thus exhibit more trials than enduro heritage in their genetics. The Ossa Explorer is a case in point. The base bike is the Ossa TRi280 trials. While the frame, wheels, engine and transmission are directly from the trials bike Ossa have modified the suspension and added a rear subframe. Normally trials bikes do not have a subframe as there is no seat to support. Ossa have however added a steel rear subframe and what is a normal enduro bike sized seat. Because the Ossa has less travel than an enduro bike the seat is however a low 820 mm, compared to the average 950 mm of current enduro bikes. Though suspension travel remains much the same as the trials bike Ossa have elected to fit a slightly less expensive fork set to the Explorer along with a somewhat less sophisticated rear shock. Other additions include basic lighting and instrumentation to make the bike street legal - as required by law in many markets for trailriding. The Explorer can make light of ugly terrain. The new fuel injected Ossa engine is powerful and responsive at all revs. The massive trails flywheels make it hard to stall and the hydraulic clutch is light, positive and seemingly impervious to abuse. Whether clawing over slippery roots at minimal revs, or blasting up a vertical climb, the Explorer can make light of ugly terrain. The engine has no power valve, but torque is impressive from unbelievably low revs and power builds from there on very predictably. As the explorer weighs almost nothing in dirt bike terms initial acceleration is very responsive, feeling at first more like a powered mountain bike than a dirt bike. The fuel injection remains crisp at all speeds and the engine is comfortable and smooth even when buzzing along gravel roads. Fast tar sealed roads are stretching the bike’s ability and as geared 90kph feels about as fast as you would cruise. As the terrain becomes easier and speeds increase, the Ossa’s six-speed competition trials internal gear ratios are not best-suited to higher trail speeds. In trials fashion the lower three gears are very low and very close-spaced. Even on extreme trail rides much of the riding happens at speeds just above the range of the first three ratios, so there are large gaps top three gears. Increasing overall gearing exacerbates the upper gaps, decreasing the gearing makes the already very close lower three ratios uselessly packed for trail riding and further limits top gear cruising. A dedicated hybrid six speed gear cluster with more evenly spaced ratios would make the bike far more effective and more fun. In tight going the Explorer can maintain remarkably good average speeds. The Explorer is fitted with typically trials suspension. That is to say the components are lightweight and with about half the travel common on an enduro bike. The shorter suspension means the bike has a lower centre of gravity, which is great over obstacles but the hybrid is not able to run with an enduro bike at any real speed on rough, open ground. Handling is fantastically light and the steering micro precise. If you have never ridden a trails bike before you will find the small size, lack of weight and overall level of response quite startling at first . A small amount of body input or shift in weight makes a big difference to your line and the amount of traction available from the trials tyres. While we are talking trials tyres, these take some getting used to as well. Though they lack bite in soft grass, on slick clay, tree roots, logs, papa clay and rocks, they give uncanny grip and confidence. Ossa's interpretation of what a hybrid seat should be like is just about perfect. The seat is long enough to allow an average-sized rider to sit with a comfortable knee angle. The seat height is low enough for shorter riders to get a both feet on the ground very easily and can be used to take the rider's weight when you need to lift your feet up to clear very deep ruts, one thing that genuine trails bike do not cope with well. Really deep ruts are not often seen in trials as trails bikes simply don't dig ruts, however in trail situations where knobbly tyred enduro bikes have dug a trench a trails bike rider is forced to perform very tricky long one-legged standing wheelies to clear deep ruts. Unfortunately Ossa have not fitted their top line forks and shock to this model. The rear shock feels to be more stiffly sprung than the trials version and the shock itself a bit crude and lifeless in action. No doubt this is a cost saving and a nod to the pillion pegs that come with the bike. Perhaps this make sense in Europe, but in my town a bloke takes his senorita to town in a comfortable waterproof car, not on the back of a trials bike. If this is the case I would much rather see a better shock with a plusher trials-like action and accept that riding pillion on a trials bike is unlikely to be the next big thing. All that said, the Explorer rear suspension works well enough, and the forks somewhat more so. In tight going where the trials suspension's ability to provide good traction is paramount the set up can allow a rider to maintain remarkably good average speeds. Most of the bike is superbly crafted and detailed. In the main its hard not to be impressed by the detail design of the Ossa. Most of the bike is crafted in precise cast alloy components and there’s even a nifty under-seat tool area. There were a couple of glitches on the 2012 model I rode, notably the soft road-legal footpegs and steel brake pedal required for road legality, though to be fair the NZ importer replaced these FOC with genuine TR280i parts. It was also necessary to move the vulnerable ignition switch somewhere safer. At times the Ossa also proved difficult to start. We would kick for a few minutes with no result and suddenly the bike would go. Indications are that Ossa are already addressing these issues and it has been rumoured considering alternative gear ratios and a re-think of the rear shock. Ossa have also come up with an 'easy start kit' that boosts starting voltage. By my estimation all modern bikes should be easy to start and the kit should be sent out FOC. So far it seems it has not. The Ossa Explorer is 25kg lighter than the KTM Free Ride. On balance I think the Ossa Explorer is a welcome and technically fresh hybrid option. If you are looking for an ultra-light trail bike that can tackle longer rides through the toughest imaginable terrain then there’s nothing I have yet ridden to match the Explorer’s ability. While the KTM Free Ride may boast more suspension travel and speed potential, the Free Ride carries a 25kg weight penalty and the KTM’s EXC based four stroke engine simply can’t match the genuine all-round pulling power and stall-free nature of the two stroke Explorer. In technically difficult situations where the Free Ride will stall simply through lack of flywheel effect the Explorer will drop to idle speed if necessary and accelerate cleany away without the ride even thinking of fanning the clutch. To justify the Explorer’s open country limitations you would have to be intending on doing a lot of challenging trail riding. Though the 2012 bike has some glitches it is in my view the most capable hybrid so far, for the extreme end of the trail riding scale. If Ossa could improve the gearbox and rear shock the bike would be considerably better again. Since I first penned this test KTM have announced the impending release of a two stroke version of the Free Ride, with a more appropriate heavier-flywheeled engine. Undoubtedly this move will address the stalling issue (the Free Ride's greatest limitation in my view) and will bring the OSSA and the KTM closer in character. The competition is good news for the hybrid concept and it will be fascinating to see if these two quite different ideals of what a hybrid should be do in fact start converging, the KTM with a more tractable engine, the Ossa with more trail-oriented gear ratios and better starting. Meanwhile, if you love seriously tight trails, if you enjoy riding the most challenging terrain imaginable, with relative ease and if you need to ride farther than a trails bike can go in greater comfort, then the Ossa Explorer can do all that for you and more. Update 2014: With KTM have now introduced the two stroke version of the Freeride with a heavier flywheel. Click here to see a longer version of this video.